Boasting panoramic views of Amber lakes, Amber Lodge is a stunning venue finished to the highest standards. Boasting panoramic views of Amber lakes, Amber Lodge is a stunning venue finished to the highest standards. The venues large indoor open space has an impeccable finish being made almost entirely of oak, giving the space a warm amber glow. 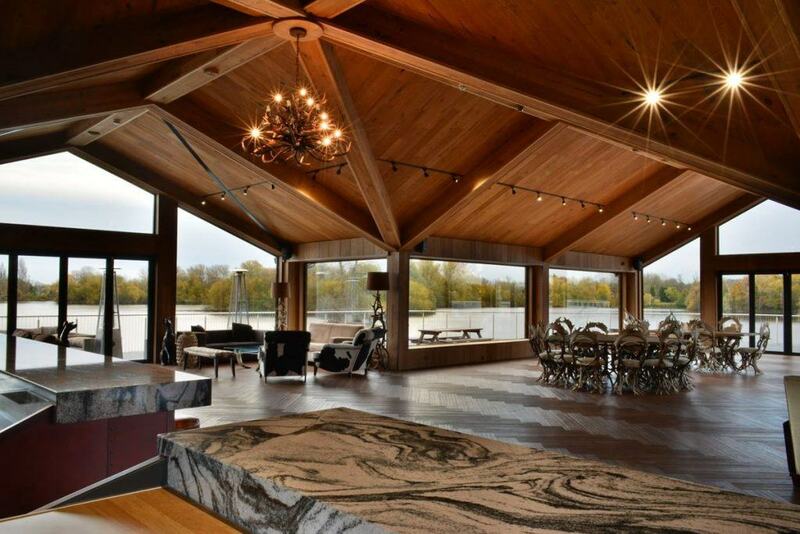 The floor to ceiling windows give panoramic views of the surrounding lakes. The Lodge hosts a marble topped bar and is flanked by a large wrap-around slate terrace and lawns overlooking the water. 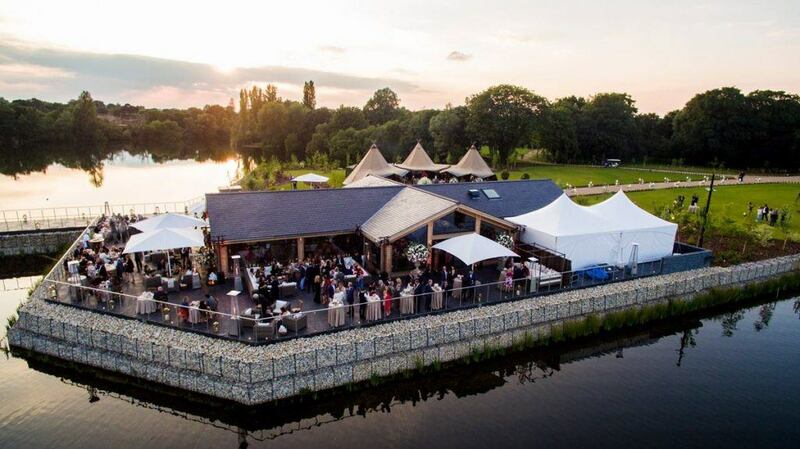 With a stunning terrace overlooking the lake, this venue is perfect for BBQs and receptions, offering the perfect spot to enjoy a glass of wine at the end of the day. Designed with events in mind, the venue can seat 120 guests for dinner on long tables or rounds. Drinks receptions can be enjoyed within the Lodge or on the terraces depending on the weather. For standing receptions Amber Lodge can accommodate up to 250 guests or with the addition of a marquee or tipi the capacity increases to 500. The venue hosts a variety of events including corporate away days, senior management conferences, luxury dinners, parties and receptions as well as larger activity days and weekend wedding receptions. As soon as you arrive at Amber Lakes you can feel the stresses of the city disappear – this is a calm space with room to breathe. It’s the perfect venue for working on ideas making it popular for meetings and events. For clients flying into Heathrow, it offers a beautiful first impression of England. Amber Lodge works well for smaller, intimate conferences. Equally it is popular for larger summer activity days where the whole site becomes an area to explore. The outside area becomes an extension of the venue with the wraparound terrace and landscaped lawns making perfect lunch spots.